to the United States, "Spain by Day." Lester Ziffren reported the start of Spain's 1930's civil war, created and solved mysteries for film detective Charlie Chan and represented the United States government in South America. Until his death November 12, 2007 in New York at age 101 he was believed to be the oldest living former employee of United Press. The cause of Ziffren's death was congestive heart failure. In a wide-ranging career that took him from his hometown newspaper in Illinois to New York, Buenos Aires, Madrid, Hollywood, Santiago and other Latin American capitals, Mr. Ziffren went from foreign correspondent to screenwriter to film industry agent, diplomat and public relations executive. Ziffren was born April 30, 1906 and grew up in Rock Island, Ill.
An opportunity to cover golf for the local newspaper led him to seek a career in journalism. At his 1927 graduation dinner from the University of Missouri School of Journalism, he took the opportunity to ask for a job from the visiting president of the United Press. He got one. A year later he was in Buenos Aires and covered South American revolutions throughout the late 1920's. After working on UP's foreign desk in New York for several years, he was sent to Madrid in 1933, just as Spain was becoming an early indicator of the turmoil that would engulf Europe and much of the world later in the decade. "Ziff," as he came to be known, became friendly with the likes of author Ernest Hemingway and the U.S. ambassador, Claude Bowers. "MOTHERS EVERLASTINGLY LINGERING ILLNESS LIKELY LARYNGITIS AUNT FLORA OUGHT RETURN EVEN IF GOES NORTH LATER EQUALLY GOOD IF ONLY NIGHT " ... continuing in a similar and seemingly nonsensical way. "MELILLA (a Spanish seaport in Morocco) FOREIGN LEGION REVOLTED MARTIAL LAW DECLARED." That was the first word to get through Spanish censorship that parts of Spain's military had revolted. And it meant the start of Spain's bloody civil war. Elements of the army, supported by Fascist Italy and Nazi Germany, fought to overthrow the government of the Spanish Republic. Some of the savagery of the fighting set the stage for similar tactics employed by the Nazis when Germany began its campaign of aggression not long thereafter. 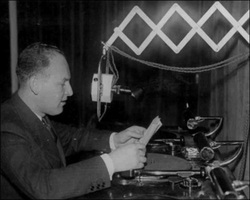 In addition to his newspaper dispatches, from 1934 on, Mr. Ziffren provided nightly broadcast reports for United Press to the United States and South America on the run up to the war. He wasn't there to see its end: the 1939 victory of the rebelmilitary faction known as the Nationalists. By late 1936, Mr. Ziffren had managed to run afoul of the Nationalist leader, General Francisco Franco. Threatened with harm and feeling the threat itself compromised his objectivity, he decided to leave Spain. Months later, he said "even now I have violent nightmares and wake up in a cold sweat; when I start talking about Spain, I start weeping for no reason at all." Franco ruled Spain for the next four decades. Turning down a UP offer a job in Rome, Mr. Ziffren wound up in Los Angeles, meeting up with Edythe Wurtzel, whom he had met earlier in Madrid. She was connected to the film industry through family members who worked at Twentieth Century Fox and her father, a Hollywood agent. Mr. Ziffren married Ms. Wurtzel and joined Fox as a scriptwriter. After working on a handful of films in the late 1930's, he was assigned to the Charlie Chan detective series that Fox had been turning out for about a decade. The films were very popular and Fox decided to continue them after the 1938 death of actor Warner Oland, who originally played the role. Sidney Toler took over the role of Chan and Mr. Ziffren was among the writers credited with creating a half dozen early 1940's murder mysteries the enigmatic and philosophical Chan was called upon to solve with the dubious help of various less intuitive offspring. Among the films were "Charlie Chan in Panama" and "Charlie Chan in Rio," whose Latin American backdrops became hints of Mr. Ziffren's next career. After the American entry in World War II, Mr. Bowers, the former U.S. ambassador to Spain, asked for Mr. Ziffren's help in his new post as ambassador to Chile. Mr. Ziffren and his wife moved to Santiago and he worked for the U.S. government's Inter-American Affairs Department. After the war, he returned to Los Angeles and took over his late father-in-law's Hollywood agency for several years, where he represented famed director John Ford and Merian C. Cooper, who was a frequent collaborator of Mr. Ford's, but who was perhaps best known as the producer of "King Kong" and its sequels. But in 1952, he went back to South America as a diplomat, with State Department postings in Colombia, and Chile. There, he later became head of public relations for Braden Copper, the Chilean subsidiary of giant Kennecott Copper. Moving to New York in the early 60's, he became public relations director for Kennecott. Mr. Ziffren helped set up and headed the North American-Chilean Chamber of Commerce and was the recipient of the highest decoration the Chilean government gives to foreigners, "The Order Of General Bernardo O'Higgins." Until his recent illness, "Ziff" remained active and was an avid consumer of his earliest profession, reading several daily newspapers. Well into his 90's, he remained involved in Chilean-American economic affairs and attended gatherings of former United Press colleagues and their UPI successors. Edythe Wurtzel Ziffren died in 1977. Survivors include his daughter, Didi Hunter, herself a former staffer with United Press International's onetime television news service, and her husband Andrew, a visiting professor at Cornell University in Ithaca,NY.